Details relating to the Maltese Commemorative of 2012. This coin is the second in the five part series dealing with the constitutional history of Malta. What is specifically commemorated is the introduction of Majority Representation in 1887. Until this date the elected members could only advise the British Governor. In the inner circle we see a group of happy people in front of the Maltese Parliament in Valette. Around the upper edge of the inner circle is the inscription “MALTA – Majority representation 1887. At the bottom, at six o’clock , is the year of issue 2012. 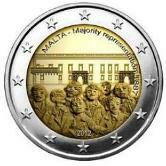 Return from Maltese Commemorative 2012 to euro coin collector.